The NFL’s news cycle is never quiet, even in the offseason. 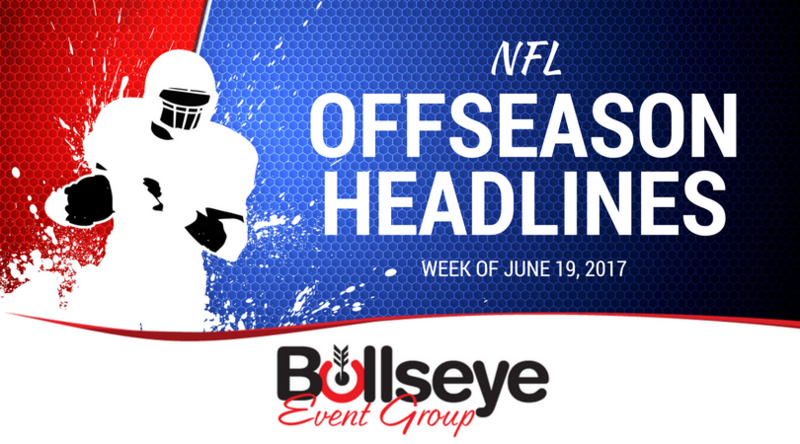 Taking a look at the top headlines in the league from the week of June 19th, 2017. Despite suffering a broken leg in Week 16 of the 2016-17 NFL season, Oakland Raiders quarterback Derek Carr had the best statistical season of his career, helping lead the team to an AFC West title and an NFL Playoffs berth, finishing the year with 3,937 yards, 28 touchdowns and six interceptions. Now, the fourth-year quarterback can add another title to his resume; highest paid NFL player in league history. The Raiders signed Carr to a five-year deal worth $125 million on Thursday, including $70 million in guarantees and a $40 million signing bonus, a deal Carr confirmed via his Twitter account. Carr now makes just slightly more than the previous record, a contract signed last year by Indianapolis Colts quarterback Andrew Luck, averaging a whopping $24.6 million annually. The Super Bowl LI champs have set their sights at re-loading their team with even more firepower in the 2017 NFL offseason, and that mission seems to be continuing well into late-June. Former All-Pro New York Jets linebacker David Harris signed a two-year deal with the champs on Wednesday, according to ESPN’s Adam Schefter. And confirmed by NFL Network’s Ian Rapoport, the deal is worth a $5 million base value, with $1.25 million guaranteed. Former Jets LB David Harris has reached agreement on a two-year deal with…the New England Patriots, source tells ESPN. And stop us if you’ve heard this one before – Bill Belichick swoops in and grabs a proven veteran who was released and adds to his arsenal for a fraction of the price. In a surprise move, both due to the timing of the announcement as well as the announcements themselves, the Kansas City Chiefs and general manager John Dorsey are parting ways with one another after four seasons. Dorsey, who took the general manager job in January of 2013, had built a roster that went 43-21 and made three playoff appearances since taking the job. Though teams choose to move on from their front office staff frequently, the timing of this announcement seems to be odd. Not many teams choose to make a change at the helm post-free agency, post-draft and most definitely not approaching the months of July.